We all know the story of Adam and Eve. The first humans. The first sinners. God created a beautiful garden for them, and only one restriction: don't eat from one of the trees. And, being God, He knew exactly what would happen. They ate. They got knowledge of good and evil. They brought death into the world. But there were actually two named trees, likely among hundreds, in the text: the tree of the knowledge of good and evil, and the tree of life. Have you ever thought about what would have happened if Adam and Eve had eaten of the latter before the former? 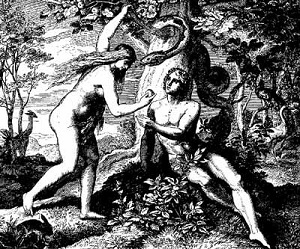 What if Adam or Eve had taken a bite from the tree of life (which was NOT forbidden) before the serpent showed up and tempted her? What if humanity had to live forever in transgression? What if sin's wages (Romans 6:23) couldn't be paid? What if our everlasting life was filled with sin, rather than grace? With condemnation, rather than peace? I don't know about you, but I'm VERY glad that God did not allow that to happen. Cuz I sure don't want to live in sin forever - or live forever in sin. And there's more good news. The Tree of Life? It'll be making a return visit. It will take a trip from the first book of the Bible to the last. Eternal life WITHOUT sin - that sounds a LOT better, doesn't it? Heavenly Father, thank You for making a way for us to have everlasting life in You, despite our sin and the legacy of Adam and Eve. Help us to live out our love for You in light of Your gift of eternal life to us. In Jesus' name I pray, Amen.